One main goal is to greatly improve the machine’s capability to listen to and understand music. This will lead to groundbreaking technologies to help everybody better understand and appreciate music. One main application is to make music more accessible and engaging. We extend further the design of our leading computational framework aimed at extracting a large set of information from music, such as timbre, notes, rhythm, tonality or structure. Yet music can easily become complex. To make sense of such a subtle language, refined musicological considerations need to be formalised and integrated into the framework. Music is a lot about repetition: motives are repeated many times within a piece, and pieces of music imitate each other and cluster into styles. Revealing this repetition is both challenging and crucial. A large range of musical styles will be considered: traditional, classical and popular; acoustic and electronic; and from various cultures. The rich description of music provided by this new computer tool will also be used to investigate elaborate notions such as emotions, groove or mental images. Beyond the academic domains of musicology, music informatics and music cognition, this project is oriented towards the development of groundbreaking technologies for the general public. Music videos have the potential to significantly increase music appreciation. The effect is increased when music and video are closely articulated. Our technologies will enable to generate videos on the fly for any music. One challenge in music listening is that it all depends on the listeners’ implicit ear training. Automated, immersive, interactive visualisations will help listeners (even hearing-impaired) understand and appreciate better the music they like (or don’t like yet). This will make music more accessible and engaging. It will be also possible to visually browse into large music catalogues. Applications to music therapy will also be considered. Short bio: Olivier Lartillot is a researcher working in the fields of computational music and sound analysis and artificial intelligence. He designed MIRtoolbox, a referential tool for music feature extraction from audio. He also works on symbolic music analysis, notably on sequential pattern mining. In the context of his 5-year Academy of Finland research fellowship, he conceived the MiningSuite, an analytical framework that combines audio and symbolic research. Olivier just finished working for the SoundTracer project, an innovation project in collaboration with the National Library of Norway. 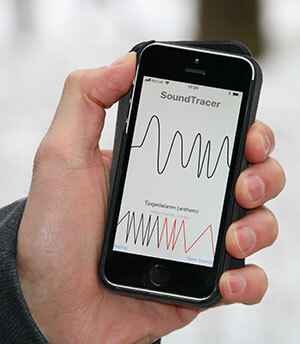 The idea was to develop a prototype mobile app for a "query-by-gesturing" system, in which the user would perform a gesture and retrieve a sound file from the entire collection of the National Library of Norway. Olivier continues developing his music analysis software MiningSuite with planned integration of musical gesture analysis. He also collaborates on the TIME project. Olivier has given courses in Music Information Retrieval, conference tutorials and has taught in various summer schools. He has collaborated on various projects around the topics of artificial intelligence, signal processing, cognitive science, neuroscience, music analysis, ethnomusicology and music therapy. He has written 80 articles, with more than 2000 citations. He is a member of the Editorial Board of the Transactions of the International Society for Music Information Retrieval, is an expert evaluator for the European Commission's Horizon 2020 program and has participated to the Program Committees of various conferences. Background Automated detection of pitch in polyphonic music remains a difficult challenge (Benetos et al., 2013). Robust solutions can be found for simple cases such as monodies. Implementation of perceptive/cognitive models have been so far less successful than engineering methods, and in particular machine learning models. One reference model (Klapuri, 2006) preselects pitch candidates based on harmonic summation and searches for multiple pitches through cancellation. Aims The aim was to conceive a model for pitch detection in polyphonic music able to transcribe in details traditional Norwegian music played on Hardanger fiddle, where more than two strings are played at the same time. The new model should be applicable to other types of music as well. Perceptive and cognitive models should guide the improvement of the state of the art. Main Contribution The model is neither based on a machine-learning training on a given set of samples, nor explicitly relying on stylistic rules. Instead, the methodology consists in conceiving a set of rules as simple and general as possible while offering satisfying results for the chosen corpus of music. We follow some general principles of the model by (Klapuri 2006) while introducing new heuristics. We present a new method for harmonic summation that penalises harmonic series that are sparse, in particular when odd partials are absent, as it would indicate that the actual harmonic series is a multiple of the given pitch candidate. Besides, a multiple of a fundamental can be selected as pitch in addition to the fundamental itself if its attack phase is sufficiently distinctive. For that purpose, we introduce a concept of pitch percept that persists over the whole extent of the note, and that serves as a reference for the detection of higher pitches at harmonic intervals. Results The proposed method enables to obtain transcriptions of relatively good quality, with a low ratio of false positives and false negatives. The construction of the model is under refinement. We are applying this method to the analysis of recordings of Norwegian folk music, containing a large part of Hardinger fiddle pieces and a cappella singing. Implications Automated transcription is of high interest for musicology and music information retrieval. This enables for instance to build large corpora of scores for music analysis and opens news perspectives for computational musicology. By attempting to design computer models based on general rules as simple as possible rather than on machine learning, while resulting in a behaviour in terms of pitch detection that comes closer to human capabilities, we hypothesise that the underlying mechanisms thus modelled might suggest general computational capabilities that could be found in cognitive models as well. In the same time, an improvement of the model based on expertise in music perception and cognition is desired. References Benetos et al. (2013). Automatic music transcription: challenges and future directions. Journal of Intelligent Information Systems, 41, 407-434 Klapuri, Multiple Fundamental Frequency Estimation by Summing Harmonic Amplitudes. ISMIR 2006 Keywords: pitch, computational model, harmonic summation, Norwegian folk music, Hardanger fiddle. Lartillot, Olivier (2019). The MIRAGE project. Cette présentation offrira un panorama des diverses méthodes d’analyse musicale par ordinateur conçues et/ou développées par O. Lartillot, couvrant aussi bien l’analyse d’enregistrements sonores que représentations « symboliques » (c’est-à-dire partitions informatisées ou séquences MIDI). J’expliquerai aussi brièvement les enjeux musicologiques et épistémologiques sous-jacents. La boîte à outils MIRtoolbox produit un éventail assez large de descriptions audio et musicales de fichiers sons. Elle a été par exemple utilisée pour étudier le timbre dans la musique extra-européenne, en collaboration avec Stéphanie Weisser. J’ai également conçu de nouvelles techniques d’analyse mélodique et motivique de représentations symboliques, avec des applications notamment à l’analyse de musiques traditionnelles arabes et turques. Since the dawn of informatics, computer-based analysis of notated music has been attempted. I present a brief overview of the research in this area, covering the various tasks of music analysis, such as melodic, rhythmic, metrical, motivic or structural analyses, and evoking diverse methodological alternatives. I will discuss about the current state of the art, in particular the limitations of computational approaches so far, the technical challenges, and how I propose to transcend the current limitations. Practical applications of this area of research will be discussed, such as retrieval of musical queries in databases, automated identification (of genre, composer, etc.) or music performance and generation. In the first part of this talk, I will give a short and broad overview of the MiningSuite, a Matlab toolbox that combines sound, music and gesture analysis. I will give a quick tour of the various types of sound and music analyses that can be carried out using the toolbox, covering a large range of musical dimensions such as timbre, rhythm, harmony or structure. The MiningSuite, integrating previous toolboxes such as MIRtoolbox and MIDI toolbox, can be used both for the analysis of audio recordings and of “symbolic” representations such as MIDI files. I will also present the current integration of motion capture and gesture analysis (from the MoCap Toolbox), as well as other sensor data such as breathing. The benefit of articulating these different types of analyses into a single framework will be demonstrated. In the second part, I will present a project aimed at automatically extracting melodic gestures from a catalogue of folk music recordings from the National Library of Norway. While melodic lines can be easily extracted from a cappella songs, the task is more challenging for other types of music such as Hardanger fiddle music. In such cases, we need to automatically transcribe the recordings and track melodic voices throughout the counterpoint of each composition. I will also present an iPhone app that enables to draw a gesture in the air with the phone and to find pieces of music from the catalogue that is characterised by a similar musical gesture. Lartillot, Olivier (2018). Cookbook 1: Sound analysis in Matlab. Lartillot, Olivier (2018). MIRToolbox and MiningSuite. MIRtoolbox offers an integrated set of functions written in Matlab, dedicated to the extraction from audio files of musical features such as tonality, rhythm, structures, etc. The objective is to offer an overview of computational approaches in the area of Music Information Retrieval. The design is based on a modular framework: the different algorithms are decomposed into stages, formalized using a minimal set of elementary mechanisms. These building blocks form the basic vocabulary of the toolbox, which can then be freely articulated in new original ways. These elementary mechanisms integrates all the different variants proposed by alternative approaches - including new strategies we have developed -, that users can select and parametrize. This synthetic digest of feature extraction tools enables a capitalization of the originality offered by all the alternative strategies. Additionally to the basic computational processes, the toolbox also includes higher-level musical feature extraction tools, whose alternative strategies, and their multiple combinations, can be selected by the user. The choice of an object-oriented design allows a large flexibility with respect to the syntax: the tools are combined in order to form a sets of methods that correspond to basic processes (spectrum, autocorrelation, frame decomposition, etc.) and musical features. These methods can adapt to a large area of objects as input. For instance, the autocorrelation method will behave differently with audio signal or envelope, and can adapt to frame decompositions. Lartillot, Olivier (2018). MoCap Toolbox in the MiningSuite. Lartillot, Olivier (2018). Music and Voice Analysis using Matlab: MIRtoolbox and the MiningSuite. Lartillot, Olivier (2018). Overview of signal-based rhythm analysis. This course gives an introduction to analysis of signals, audio recordings, music recordings and music scores with MiningSuite - a free open-source Matlab toolbox. The MiningSuite is a free open-source Matlab toolbox for the analysis of signals, audio recordings, music recordings and music scores (and soon video and motion trajectories) under a common modular framework. The MiningSuite adds a syntactic layer on top of Matlab, so that advanced operations can be specified using a simple and adaptive syntax. This makes the Matlab environment very easy to use for beginners, and in the same time allows power users to design complex workflows in a modular and concise way through a simple assemblage of operators featuring a large set of options. The MiningSuite is an extension of MIRtoolbox, a Matlab toolbox that has become a reference tool in the Music Information Retrieval (MIR) research and academic community. In this course, you will first learn the basic principles of the MiningSuite’s syntax, which enables you to quickly design analytic processes, from simple operators to complex pipelines. You will get a broad overview of the analytic tools available, from basic signal processing to auditory modelling to music analysis. All concepts will be explained from the ground up, so that no prior expertise in signal processing or in music analysis is required. The MiningSuite is a free open-source and comprehensive Matlab framework for the analysis of signals, audio recordings, music recordings and music scores (and soon video, and more to come later) under a common modular framework. The MiningSuite adds a syntactic layer on top of Matlab, so that advanced operations can be specified using a simple and adaptive syntax. This makes the Matlab environment very easy to use for beginners, and in the same time allows power users to design complex workflows in a modular and concise way through a simple assemblage of operators featuring a large set of options. The MiningSuite is an extension of MIRtoolbox, a Matlab toolbox that has become a reference tool in the Music Information Retrieval (MIR) research and academic community. This paper describes the two variants OL1 and OL2 of the model submitted to the MIREX 2018 tempo estimation tasks, and compare them with respect to my previous submission for MIREX 2013.